The Centre for Cities’ 2015 Cities Outlook report shows the gap between Britain’s best- and worst-performing cities has dramatically widened since 2004 – creating a two-tier economy of dynamism and decline. It finds that for every 12 net new jobs created between 2004 and 2013 in cities in the South of England, only one was created in cities throughout the rest of Great Britain. Given the scale of the challenge facing the next Government, the report calls on all parties to ensure their visions for growing cities are based on significant devolution of both fiscal and structural power, providing incentives for cities to support economic growth, and giving greater flexibility to ensure money can be spent where it is most needed. Cities Outlook is the annual health-check of the economic performance of the United Kingdom’s 64 largest cities. This year’s report maps the fortunes of cities over a decade of economic boom and bust, during which three major parties have held power. It reveals that national growth between 2004 and 2013 was largely driven by only a handful of cities – mainly located in the South – which have seen their populations boom, their number of businesses grow, and thousands of new jobs created. At the same time in other cities, migration of young and skilled workers, a lack of business growth, and falling employment opportunities have led their economies to contract. Milton Keynes’ population grew by 16.5 per cent, while in Sunderland it contracted by 1.4 per cent. Swindon’s number of net additional businesses climbed 29 percent, while Grimsby lost 5.5 percent of its business base. Even the best-performing cities in the South are now facing threats to their further progress – primarily, the unprecedented growth in housing prices, which their leaders cannot address in a targeted or decisive way.Yet despite being the most centralised nation in the advanced world, Cities Outlook 2015 shows how successive Governments’ efforts to respond to this changing landscape have failed to rebalance the national economy, with policy interventions and funding consistently too small, ad hoc, complicated and costly for cities to implement.The global financial crisis, the move to knowledge-intensive businesses, and the increasing integration of technologies in workplaces, have left some cities with a weaker business base from which to create jobs and drive growth, and have seen others – such as London, Brighton and Cambridge – reach new heights of prosperity. Cities Outlook 2015 will be formally launched at City Hall in London on 19 January 2015. For more information, see here. Cities Outlook is the authoritative annual economic index of the UK’s 64 largest cities and towns, prepared by the Centre for Cities – an independent, non-partisan research and policy institute. Committed to helping Britain’s cities improve their economic performance, the Centre produces practical research and policy advice for city leaders, business and Whitehall. Number of New Jobs: ONS 2014, Annual Business Inquiry 2004, 2005, 2006 and 2008 data; ONS 2014, Business Register of Employment Survey, 2009 and 2013 data. Due to breaks in the data series, these statistics have been calculated by adding together the differences in jobs between 2004-2006, 2006-2008 and 2008-2013, and dividing by jobs in 2004. This data set excludes Belfast. The ONS’ Annual Business Inquiry (ABI) and Business Register of Employment Survey (BRES) have been used to calculate private sector jobs figures, as the only official dataset that provides figures by sector at the local authority level. The ABI gives estimates to 2008, and was replaced by BRES in 2009. The Centre classifies the ‘public sector’ as the sum of the Standard Industrial Codes of Public Administration and Defence, Health and Education. While this definition will include some private sector employment, such as private hospitals, it does give a consistent estimate of public sector employment over the 10-year period. 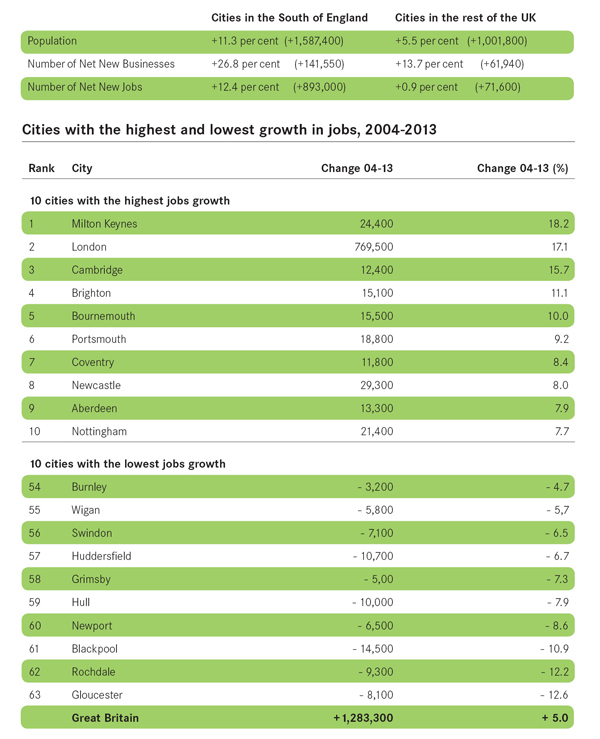 Milton Keynes is identified as the city with the highest job growth. But ONS figures show that between 2004 and 2014 the percentage change in the employment rate of residents aged 16 & over fell from 71.4% to 64.2% – one of the largest percentage point changes in the UK. The number of residents in work did increase – by 7,700 which is much less than the estimate above of the increase in the number of jobs in the city of 24,400. Most of the difference will presumably be because many of the jobs are filled by commuters into Milton Keynes. And the other reason why the employment rate fell is because the resident population grew rapidly – up 36,600, over 20% – compared to the 6.5% growth in the number of residents in work. The difference between resident employment and jobs is important because generally the areas with most of the jobs – the great cities of the UK such as London, Glasgow, Birmingham etc. – also have the lowest employment rates of residents. The jobs tend to be taken by commuters.